We are a real ale country pub in the heart of Somerset, situated at the crossroads of the A37 and A3153 in the village of Lydford-on- Fosse, between the small towns of Castle Cary and Somerton and only a mile from Wheathill Golf Club. Give us a try and sample great real ale, good wine and food in a relaxed country pub atmosphere. We pride ourselves on being a traditional English pub, with real ale poured straight from the barrel. 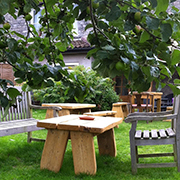 Added to this we celebrate the best of Somerset ciders plus fine wines on offer at the bar. We serve creative, tasty food and make the most of local produce. Come and try our selection of award winning pies. We know we are a pub and don't try to be a restaurant. We don’t have slot machines with flashing lights, no jukebox, no pool table and above all no television - just open fires, a comfy sofa, daily newspapers, a beautiful garden and a relaxed comfortable environment where all are welcome. We aim to make THE CROSSKEYS INN a focal point for the local community. A meeting place for clubs, groups and businesses to enjoy an informal get together, morning coffee, lunch or evening entertainment. There are regular live music events for a variety of tastes, from traditional jazz to folk and rock. We also welcome any piano players who can get a good tune from our old upright piano in the bar. Come and meet Tom Wilton and his staff, we hope you will visit and enjoy the beautifully refurbished pub with its pleasant surroundings. 6 Ensuite rooms.Stylish double rooms and deluxe Family Room from £80 per night inc breakfast. Our newly built large function room is the ideal venue for weddings, family events and business. We have all the usual business facilities including free WiFi throughout and audio visual equipment is also available. The function room has folding doors on the garden side which open back to provide full access to the garden in good weather. We will be happy to discuss your event with you and design a package to suit your requirements. Our Head Chef and team will be pleased to provide a menu to suit the occasion, from simple lunches to a full wedding breakfast. Soft seating is available for events needing extra comfort and style.